This puzzle is like a 4×4×6 Rubik's cube. The two 4×4 faces and middle layers can be turned by quarter or half turns, but the four 4×6 faces and slices only allow half turns, unless you allow the puzzle to change its shape. 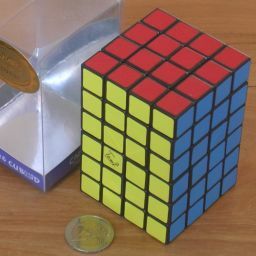 If you do allow it to change shape by using quarter turns of the sides, then the centre of the puzzle acts like a 4×4×4 Rubik's cube. The parts from the outer layers cannot be separated from its adjacent part until the shape has been changed so as to form a complete outer layer. There are two versions of the puzzle. One is coloured like a cube, with each face a different colour. 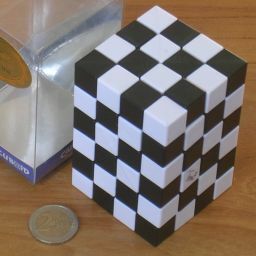 The other has just two colours, and its solution has the pieces alternating in colour like a chessboard. This version has no stickers, but the pieces are made from plastic of different colours. The puzzle's mechanism was designed by Tom van der Zanden. The last factor is due to there not being any fixed reference point to distinguish the sides, or the top and bottom. This gives a total of 8!10 / (4!2·217·8) = 18,801,081,744,320,115,530,520,330,240,000,000,000, approximately 1.88·1037 positions. For the two-colour version, all ten 8-piece orbits have 4 pieces of each colour. The parity condition no longer has any effect on the reachable positions, so the total number of positions is approximately 8!10 / (8·4!20) = 353,094,061,250,000,000. This is a slight underestimate, as it assumes all the positions are asymmetric. To get the exact number, we need to use Burnside's Lemma, and that shows that there are actually 353,094,061,287,791,616 positions. The outer layer extensions consist of 8 corner pieces, two sets of 8 edges. The outer layer centres have already been taken into account above as part of the core cube. The parity constraints on the permutation of these pieces are immaterial since the base pieces that the edges are connected to come in identical pairs that can be swapped. All 8!3 permutations of these outer pieces are therefore possible seemingly without affecting the core cube. Putting it all together, the total number of positions is 8!·38·24!2·8!3 / 3·4!6·28·24 = 1,895,062,596,242,205,714,284,961,357,866,439,697,401,643,008,000,000,000,000, or approximately 1.9·1057. The total number of positions is therefore approximately 8!·38·24!2·8!3 / 3·4!12·8!4·24 = 37·24!2 / 4!12·24 = 9.6054·1032. To get the exact number in full, Burnside's Lemma is needed, but the 5 most significant digits will remain the same. Hold the puzzle with the square faces at the top and bottom. Clockwise quarter turns of the top or bottom layer will be denoted by U and D respectively, half turns by U2 and D2, and finally counter-clockwise turns by U' and D'. Turns of the upper and lower inner layers will be denoted in the same way, except that the lower case letters u and d are used. For the side faces the letters F, B, L, and R represent quarter turns of the front, back, left and right face respectively. Similarly, lower case letters f, b, l, and r represent quarter turns of the vertical inner layers adjacent to the F, B, L, and R face layers. Although the final arrangement has a chessboard pattern, it is far easier to solve it by separating the colours, making the top and bottom halves each one colour. From there it is easy to create the chessboard pattern. Phase 1: Bring the puzzle into the cuboid shape. If the puzzle already has the correct shape, then skip this phase. Note that for this phase only, I will use U and D to refer to the top/bottom layers of the inner 4×4×4 cube. 1. Turn the top face to bring the centre you want to swap out at the front left. 2. Turn the front face to bring the centre you want to swap at the top right. 3. Do r U' r'. Note that you can use Rr moves of two layers instead of just the inner layer r.
Use step a until the top face centres all have outer layer extensions, turn the puzzle upside down, and do the same again for the new top face. 3. use the same methods to solve the centres of a second pair of opposite faces. 1. If you see any face moves that quickly fix the orientations of several corners, then so them. 2. Hold the puzzle with the extended centres at top and bottom, and with an incorrectly twisted corner at the top front right location. 3. Using only L2, B2, and D moves, bring any other twisted corner to the bottom front right corner. Those moves do not affect any corner orientations nor move the first corner. 4. At least one of the corners should extend out on the front face. If not, you can turn over the puzzle to make them both extend out forwards. 5. Do D' R F' R F'. Repeat step d until all the corners are oriented. 1. Hold the puzzle with the extended centres at top and bottom, and with the extended edge piece in the front face, and pointing extending out to the left or right (not to the front). 2. If the edge piece is in the top middle layer, then do F2. 3. Make a note of the location where this middle edge piece will be inserted. If the middle edge piece is at the left, the insertion point is the left part of the top front edge pair. If the middle edge is at the right it will be inserted in the right half of the top front edge pair. 4. Using only U, D, and B2 moves, bring an incorrectly placed edge to the insertion point at the top front. 5. To insert an edge on the left side, do the sequence d' F u' F2 d F. For the right side, do the mirror image d F' u F2 d' F' instead. Repeat step f as often as possible. If there are no extended edges in the middle layers and the top/bottom edges are not yet oriented correctly, then use step e to displace any incorrect edge by inserting any middle layer edge there, and try again. Phase 2: Make the top outer layer white. 1. Turn D until a white centre lies at the front right. 2. Turn U until a non-white centre lies at the front left. 4. Repeat steps 1-3 until all the U centres are white. 1. Turn D until a white edge lies at the front. 2. Turn U until a non-white edge lies at the front, but not directly above the white piece. 3. If the white edge is on the right, do D r2 U' R2 U r2, otherwise do D' l2 U L2 U' l2. This should move the two incorrect edges to the opposite layers. 4. Repeat steps 1-3 until all the U edges are white. 1. Turn D until a white corner lies at the front right. 2. Turn U until a non-white corner lies at the front right. 3. Do R2 U R2 U' R2. This should move the two incorrect corners to the opposite layers. 4. Repeat steps 1-3 until all the U corners are white. Phase 3: Make the top inner layer white. Note that d and u in this phase denote the bottom and top inner layers. 1. Turn d until a white edge lies at the front right. 2. Turn u until a non-white edge lies at the front left. 3. Do R2 u' R2 to swap the two incorrect edges. 1. Turn d until a white centre lies at the front. 2. Turn u until a non-white centre lies at the front, but not directly above the white piece. 3. If the white centre is on the right, do u' F l2 u l2 u' F, otherwise do u F r2 u' r2 u F. This should move the two incorrect centres to the opposite layers. Phase 4: Make the second inner layer white. If the puzzle was mixed without changing shape, then this will be identical to phase 3. Note that d and u will now denote the middle pair of layers. 2. Turn u until a non-white centre lies at the front. Phase 5: Create the checkerboard pattern. Do the moves l2 R2 (Uu1u2)2 F2 b2 U u2 d1. Phase 2: Solve the outer layer centres. Decide which of the two centre colours you want on the top. Hold the puzzle so that at least two top centres are already that colour. Turn U until an incorrect centre lies at the front left. Turn D until an incorrect centre lies at the front right. Repeat steps b-d until all the centres are correct. Phase 3: Pair up the outer layer edges. Find any pair of adjacent edges in the outer layers that do not have matching colours. Hold the puzzle so that this mismatched pair lies at the top front. Find the edge that has the same two colours as the left edge of your mismatched pair. Using only outer layer moves that do not disturb the first mismatched pair (i.e. L2, R2, D, B2), bring this second edge pair to the top back. There must be another mismatched pair somewhere. Without disturbing the other two mismatched pairs (i.e. using L2, R2, and D), make sure that there is an unmatched pair at the top right location. Match up the edges by doing the move sequence F2 (rR)2 U R2 U' (rR)2. Repeat steps a-e until all the edge pairs match. Phase 4: Pair up the centres of the second and fifth layers. This is essentially the same as phase 3, except using the inner layers instead of the outer ones. I will use u and d to refer to the layers second and fifth from the top respectively. Find any pair of adjacent centres in these two inner layers that do not have matching colours. Hold the puzzle so that this mismatched pair lies in the front face, in the top half. Find another mismatched centre piece within these two layers that could be matched up with the left piece of your first mismatched pair. Using only moves that do not disturb the first mismatched pair (i.e. L2, R2, d, B2), bring this second centre pair to the top half of the back face. Note that the centre matching the left one of the front pair must be the left one of the back pair (i.e. they both lie in the l layer). If that is not the case, do steps b-c again with a different mismatched centre of that colour. Without disturbing the two mismatched pairs (i.e. using L2, R2, and d), make sure that at the top of the right face there is an unmatched pair, or a pair of the same colour as the right hand centre of the front mismatched pair. Match up the centres by doing the move sequence F2 (rR)2 u R2 u' (rR)2. The move u refers to the layer that the mismatched centres start off in. Repeat steps a-e until all the centre pairs match. Phase 5: Pair up the centres of the third and fourth layers. Use the technique of phase 4, now using u and d to refer to the third/fourth middle layers, to solve these layers as far as possible. If the puzzle was scrambled without changing shape, then that method is sufficient. 1. Bring one mismatched pair to the front of the u layer, and another mismatched pair to the front of the d layer, so that they lie in a 2×2 square at the front. Then go back to step a to try again. The puzzle has now essentially turned into a 3×3×6 cuboid. All but the middle layer can be solved without breaking up the matched pairs, i.e. without using any vertical inner slice moves. The next 4 phases are exactly the same as the 3×3×4 solution. Phase 4: Solve the top and bottom layer corners. First put the corners in their correct layer. It is easy to get it so that there is only one corner in each layer that is out of place. To correct those final corners, hold the puzzle so that the in correct top corner is at the front right, and turn the bottom layer so that its wrong corner is at the bottom left, and then do R D R.
Now examine the side colours of the top layer corners to see which pieces need to be swapped to make the sides match. At most one pair needs to be swapped. The top layer corners should now be solved. Turn over the puzzle so that the bottom layer becomes the top layer, and do steps b-d to solve those corners as well. Phase 5: Solve the top and bottom layer edges. First put the edges in their correct layer. Turn the top and bottom layers so that both have an incorrect edge piece at the front, and do U2 RFR U2 RFR. Repeat this until all the edges are in their correct layers. Now examine the side colours of the top layer edges to see which pieces need to be swapped to make the sides match the corners. Repeat b-d until the top layer edges are be solved. Turn over the puzzle so that the bottom layer becomes the top layer, and do steps b-e to solve those edges at well. Phase 6: Solve the inner layer edges. First put the edges in their correct layer. To recognize whether an edge is in the right layer or not, turn the layer until its colours match those of an adjacent outer layer corner. If the colours match exactly then it is in the correct layer, but if its colours are swapped then it is incorrect. Turn u until an incorrect edge is at the front right, turn d until an incorrect edge is at the front left, and then do R d R to swap them. Repeat this until all the edges are in their correct layers. Turn u to put at least two of its edges correct. At most one pair needs to be swapped. The u layer edges should now be solved. Turn over the puzzle so that the bottom layer becomes the top layer, and do steps b-d to solve the other inner layer's edges as well. Phase 7: Solve the inner layer centres. Choose two centre pairs that you would like to swap. Hold the puzzle so that one pair lies in the back face, and the other on the left or front. Repeat a-b until the inner layer centres are all solved. Phase 8: Solve the middle layer edges. Turn the middle layer until as many of its edges are solved as possible. If two middle layer edges need to be swapped, then hold the puzzle so that one of them lies at the front right, and the other at the back (back left or back right). 1. To swap FR and BR, so R (Uu)2 R (Uu)2 R (Uu)2. 2. To swap FR and BL, so B R (Uu)2 R (Uu)2 R (Uu)2 B.
Repeat steps b-c until all the edges are solved. Phase 9: Solve the middle layer centres. If a middle layer centre is incorrect, then hold the puzzle so that it lies in the front face at the right. Look at the back face to see which of its centres are incorrect too. 1. To swap Fr and Br centres, do F (Rr)2 (Uu)2 (Rr)2, F (Rr)2 (Uu)2 (Rr)2. 2. To swap Fr and Br centres, do (Rr)2 (Uu)2 (Rr)2 F, (Rr)2 (Uu)2 (Rr)2 F.
3. To swap both front centres with the back, do (Rr)2 M2 (Rr)2 M2, where M denotes the middle layer. If necessary repeat a-b for the other pair of faces.